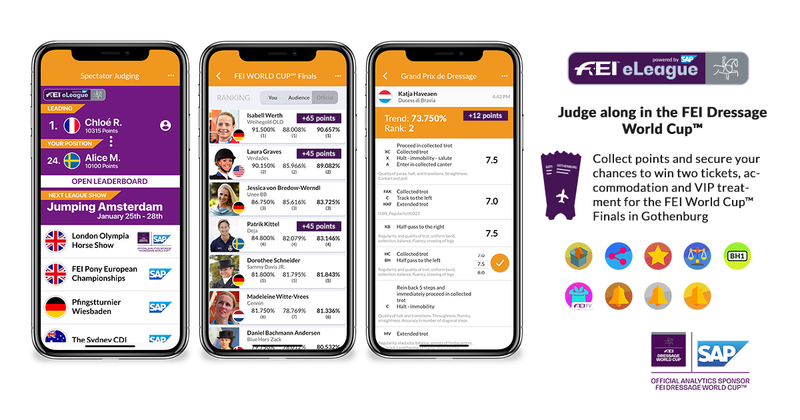 Dressage fans can now get even closer to the sport they love and win a VIP trip to this year’s FEI Dressage World Cup™ final in Gothenburg through a new mobile app that puts them in the judge’s seat. FEI eLeague Dressage, which brings together esports and major equestrian events, debuts at this weekend’s opening qualifier of the FEI Dressage World Cup™ series 2018/2019 in Herning. Download it here! FEI eLeague Dressage, developed with tech giant SAP, builds on the well-established Spectator Judging® app, which enables fans to score riders’ performances, creating audience scores and rankings in real time. Now users can collect points by participating throughout the 2018/2019 FEI Dressage World Cup™ Western European League season, both onsite and online by watching FEI TV. Players can keep track on their points and ranking throughout the season by viewing the Live-leaderboard on the FEI website. Additional options to collect points will be added over time, for example by interacting with the FEI channels or posting individual user-generated content. The overall winner will be announced after the last qualifier in the Western European League season, held at ‘s-Hertogenbosch in March 2019. They will receive an exclusive VIP trip for two persons to the FEI Dressage World Cup™ Final in Gothenburg in April, and will have the chance to go behind the scenes, meet the athletes and enjoy the Finals with all the additional excitement this immersive experience brings. “The FEI eLeague Dressage is the future of fan engagement,” said the FEI’s Commercial Director, Ralph Straus. “Fans will participate actively in the series, not only by judging, but also by sharing content. Tune into FEI TV this Sunday for the start of the FEI Dressage World Cup™ season.